After 20 years in Exuma I have, as you might expect amassed a considerable amount of fond memories and I would like to share some of them with you. One of the main reasons for visiting or living in Exuma is the Ocean. It's always warmer that 65 degrees, even in Winter. Its colors are vibrant, and vary from sandy white to deep blue. On a calm day you can clearly see the coral, the fish, the reefs, even to depths of thirty feet. Its ever changing with sandbars at low tide and amazingly as you explore the beaches chances are you will see more fish, more baby sharks, more rays, more turtles, than you will see people. (and long may it stay that way). So back to my promise to tell you of just a few of my more memorable events that few folks have the good fortune to experience. If you visit Exuma one of the trips you MUST try is to visit Chat N Chill, not just to experience the bar and restaurant and the beautiful beach, but more importantly to see, and swim with the Sting Rays. These tame docile beautiful creatures will brush against you as you stand in the shallows, you can pet them and feel their velvet like skin, you can feel them take food from your hand. Well my fond memories tops that experience ! We were renting a cottage on Hoopers Bay and I looked out over the blue Ocean and could see a shape of something large swimming parallel to the beach about 10ft offshore. I watched as it reached the end of the bay, turned and swam back, still just offshore. It was something I had never seen before. It was a Manta Ray ! From wing tip to wing tip it must have been eight foot across. Luckily I had my snorkel and mask handy, but not my camera, I ran down to the beach and stood chest deep as the majestic creature came towards me, with the graceful flying wing motion, till about 20 feet away it just stopped, facing me. For a full minute neither of us moved but I felt so calm and safe and peaceful. If you have ever had the opportunity to swim with dolphins you will know that serene feeling. After a minute the Manta Ray slowly moved in a full circle around me, always some 15ft away, then majestically turned and continued on its track. I was so excited ! Close by our home at Harbour View is the deserted island Man O War Cay. I have spent many happy days kayaking there and then walking the soft sand beaches of the eastern shore then crossing over to the western shore for the walk back. The western side tends to be a series small coves with sandy beaches then a rocky outcrop. As I walking back on a warm sunny day I approached a rocky section and could see something flapping beyond the rocks, so I slowed and crept forward being as quiet as I could thinking it was probably a heron. As I got closer I could see a large dark shape half in and half out of the water. It was a nurse shark ! 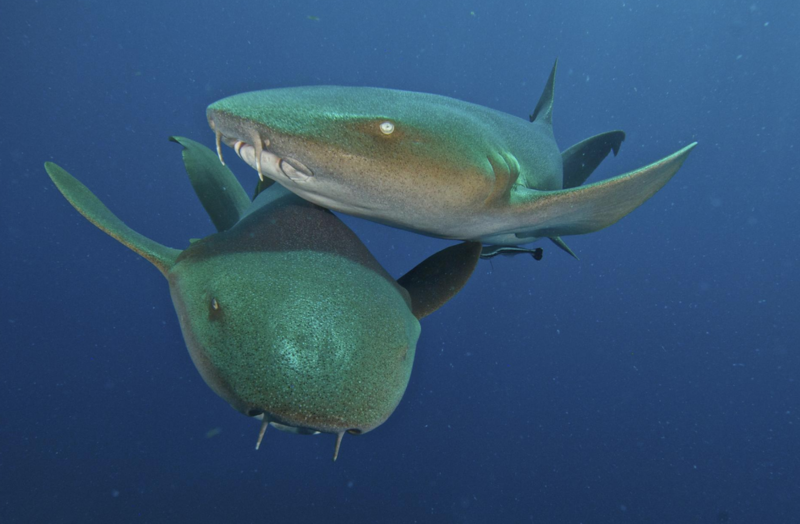 No, wait, its two nurse sharks and they are noisily mating ! The male is biting the back of the neck of the female but as he sees me just yards away, he releases her and slides off into deeper water. She just laid there for a further few minutes before she to slid into the water. I could see the male swimming back and forth some 100 yards offshore. Probably very unhappy at my arrival. My last story is a fond memory that happened in Elizabeth Harbour. Here you can see bottlenose dolphins. Not every day but often. These majestic creatures are playful and love to swim alongside moving boats. 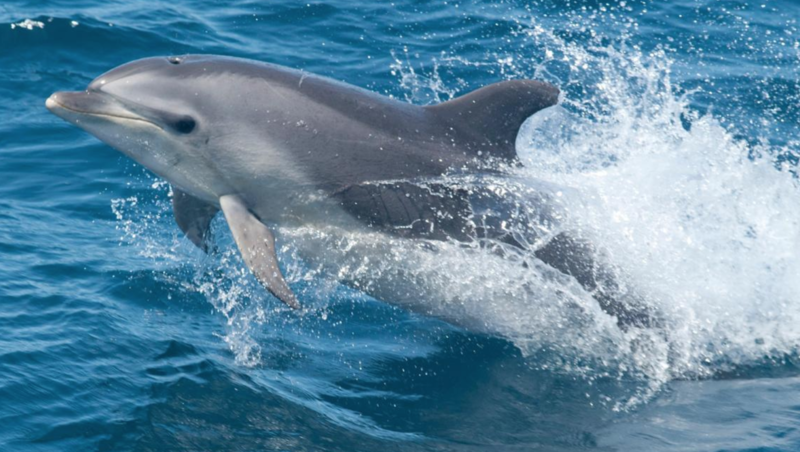 Most boat skippers will tell you how a pod of dolphins will swim alongside their boat and continually cross in front of the bow just inches away. Well in my story I was taking a 20 ft boat across the harbour to Stocking Island. As I got close to the shore I saw about eight or nine adults standing chest deep in the water very excited and agitated, so I stopped to see what was the cause of their commotion. Then I saw a dolphin surface in amongst them then dive again. It continued to dive and surface in amongst the group such that they never knew where it would be next, but the dolphin always managed to be just out of arms reach. As I watched, one person, wearing snorkel and mask, bent down to get an underwater view, took water down the snorkel, and came up coughing and spluttering having dropped the snorkel. So our attention returned to the dolphin. Where would he surface next? Then it happened ! The photo opportunity of a lifetime ! The dolphin surfaced with the snorkel in its mouth !